This week includes news from Vonage, Google, Sprint, Jabra, and Zinc. The No Jitter Roll is back in action, bringing you tidbits of news from across the enterprise communications industry. This week's selection includes everything from chatbots to UC, headsets, and integrations, and features news from Vonage, Google, Sprint, Jabra, and Zinc. Read on! Looking to improve the UCaaS user experience, Vonage this week ventured into virtual assistance with a chatbot called Vee. With Vee, users can issue simple text commands for real-time help with setting up and managing accounts, as well as troubleshooting issues. In addition, users can chat with Vee to get answers to any questions they might have on their UC service, Vonage said. Vee is available as a no-fee option for the Vonage Business Cloud (VBC), a next-generation cloud-native platform the company announced in late February. As No Jitter contributor Dave Michels, of TalkingPointz, wrote in his No Jitter post back then, VBC replaces the Essentials UCaaS offering with a modern architecture supporting technologies such as auto-scaling, containers, serverless functions, and machine learning. Vee is evidence of the latter, as it uses natural language processing (NLP) to respond to users during live chats. While Vonage purpose-built Vee as a VBC complement, accessible from mobile and Web apps, it is leveraging NLP technology from an unnamed external partner, said Ron Maayan, the company's VP of product management. Vee went into beta in mid-March for VBC mobile app users, Maayan said. In the coming months, Vonage will make Vee available for additional touchpoints, including the desktop app, admin console, and support Website, and will grow Vee's capabilities, adding in enhancements such file support, dynamic engagement tips, and the ability to initiate call actions, Maayan said. Google this week released Dialogflow Enterprise Edition, a platform for building voice- and text-based conversational experiences using machine learning and natural language understanding, Dan Aharon, Google Cloud AI product manager, wrote in a Google Cloud Platform Blog post. Dialogflow's cross-platform capabilities enable organizations to build the experience once for deployment across websites, mobile apps, other platforms, and devices like Amazon Alexa and Facebook Messenger, he wrote. The Dialogflow GA follows on the recent introduction of Cloud Text-to-Speech and updates to Cloud Speech-to-Text. Sprint this week launched Smart UC, a cloud-based voice and unified communications productivity suite powered by BroadSoft (now part of Cisco). Smart UC is aimed at addressing common enterprise challenges like increasing employee productivity, mobilizing the workforce, and reducing IT operational costs by offering a fully integrated communication and collaboration service, Sprint said. From the Smart UC interface, users get access to IM/presence, HD audio and video calling, desktop and file sharing, conferencing, mobility, real-time communications, and integrated cloud applications. Further, enterprises can integrate Smart UC into a converged IT platform comprising wireless, wired, and IoT solutions, so they can have one point of contact for Sprint services. With the converged platform, administrators no longer need countless API integrations, said Mike Fitz, VP of product for Sprint, in a prepared statement. 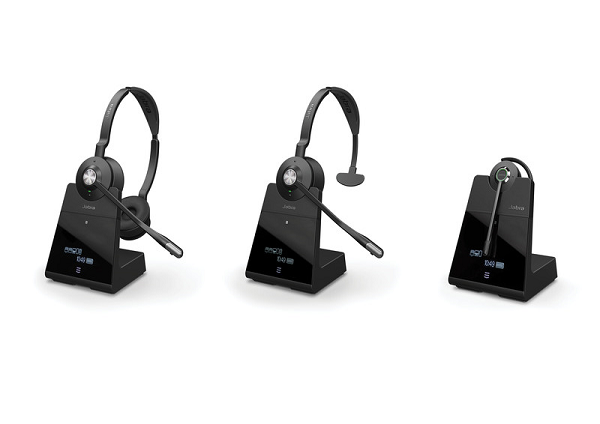 Last week, Jabra last week unveiled Jabra Engage, a line of DECT wireless headsets. The headsets feature noise cancelling microphones, long-range mobility, security features, and the ability to boost user density in shared office spaces threefold, Jabra said. Jabra Engage features a wireless range of up to 490 feet depending on the model. By way of security, Jabra Engage supports authentication and encryption functions, "along with 'physical assisted pairing' that creates a secure link-key between the headset and docking base unit," Jabra said. The line comprises the Engage 65 and 75, each available in three wearing styles: stereo, mono, and convertible (shown above from left to right). Engage 75 allows for connectivity of up to five devices, with one port for an analog desk phone, two USB ports, and support for two Bluetooth devices. Engage 65 features dual connectivity with one desk phone port and one USB port. Jabra Engage devices are now available from Jabra and partners. Pricing for Engage 65 starts at $348, and for Engage 75 at $420. Enterprise communication platform provider Zinc and ServiceMax from GE Digital this week announced joint development of a real-time communications solution for field service teams using Predix ServiceMax work orders, accounts, installed products, and contacts, they stated in a press release. Enabling field technicians to share real-time knowledge within the context of the work order should improve completion rates, as well as increase productivity and employee engagement, the companies said. Zinc itself provides an All Mode Communication platform focused on deskless workers. Now with an integration with Predix ServiceMax, organizations can streamline the way they provide service to customers. "When our field teams are in front of customers, speed and agility are critical," said Kevin Rusin, CFO of McKinley Equipment, in a prepared statement. "With ServiceMax and Zinc integrated, our technicians will be able to quickly start a conversation with colleagues or product experts and this will improve how work is complete. What's more, we will have the history of every conversation about every account of piece of equipment, accessible with just one click in Predix ServiceMax. That's priceless for any technician who will work that account in the future and will have a significant impact on customer satisfaction levels." The integrated solution is available today. Beth Schultz contributed to this article.